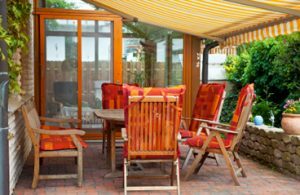 An outdoor space is an extension of the way you live indoors, in many cases complete with a wall or two, barstools and other furniture, and ways to entertain. What’s most often times missing is the good use of color. There are a variety of ways you can add color to your outdoor space that are easy and affordable. A little attention to detail and correct use of a color palette will go a long way in completing your outdoor design. No matter what your design style, there’s a color palette for that! Not every outdoor space has to use colors you would find in nature. In fact, bolder colors are gaining popularity both indoors and out. The simplest, least time consuming way to choose a color palette for your outdoor space is to visit your local paint store and stand in front of the wall of paint samples. Choose a few cards (I said cards, not colors), that catch your eye. Each card will have anywhere from 3 to 7 colors in the same family, but different hues and shades. This is the perfect starting point to choosing your palette. Select your main color (usually somewhere in the middle of the lightest and darkest) and use the other colors on the card as the direction to take when choosing the rest of your design elements. 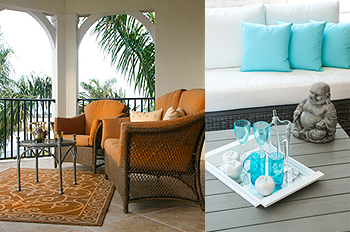 Here’s some of our favorite color schemes for outdoor! Create focal point (left). Use furniture cushions to make your colors pop (right). Once you have a pretty good idea of the colors and shades you want to incorporate into your outdoor design, the furniture is next best place to start to bring color into the space. The furniture you choose can be the focal point, using bold, accent colors, or it can be a mixture of the overall color scheme. For example, if using lighter colors in your main design, your furniture cushions could be that pop of color to really complete the space. If your outdoor space has barstools, Barstool Comforts offers a wide variety of styles and colors to help bring color into the space. If you take a look around your home, you’ll see wall deco, accent pieces, and personal touches. 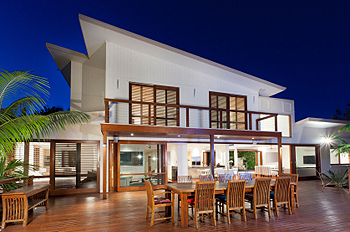 These design choices you’ve already made can easily be duplicated in your outdoor design. For example, your favorite wall decoration could be the inspiration for wall art to complete your outdoor space or family photos and mementos could be put into shadow boxes painted to compliment your color palette.